You can see that according to the PowerShell query, the VM cs01 has 1 vCPU and 2000 shares. 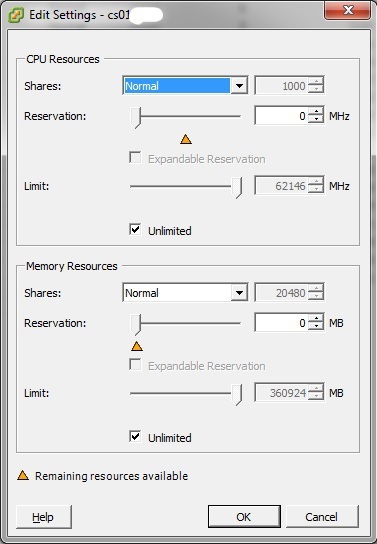 When the default setting of “normal” would be used, the 1 vCPU VM would have 1000 shares. For a 2 vCPU VM this would be 2000 shares, 4 vCPU VM would be 4000 shares, etc. In the vCenter properties of the VM however, it shows as 1000 shares and a setting of “normal”. Just a small quirk, but something to pay attention to when visually checking if all shares are set properly. Below is the PowerShell script I used to perform the check. Credits for the script go to Mr. Alan Renouf and his VMware Community PowerPack. I only added the CPUOK and MEMOK columns. PowerShell, scripting, Virtual Center, VMware CPU, limits, memory, powerhshell, reservations, shares, vCenter, VMware. permalink.